Screen time addiction in teens is a very real and serious subject. It’s up to you as their parent or guardian to monitor the amount of time spent in front of the screen and encourage other ways to spend their time. However, how can you monitor and help if you don’t know all the truths from the facts? Screen time addiction myths are everywhere and they can affect the steps you take to help. It’s time to break down the myths and get to the truth. Here are all the myths of screen addiction in teens you need to know about. Once people admit that the addiction is real, they move onto the idea that screen time addiction isn’t harmful. After all, it’s nothing like alcohol, drugs, and smoking, is it? The only person a teen is harming is themselves, right? This isn’t the case. While, yes, the direct person hurt initially is the teen, everyone is affected by the addiction. Like any other type of addiction, a person’s mood is affected by the lack of screen time they can get on some days. Relationships are severed and an individual struggles to keep a job or find their place in the world. In teens, it can affect their school work, their friends, and their general health. Teens suffering from screen time addiction don’t find it easy to sleep. 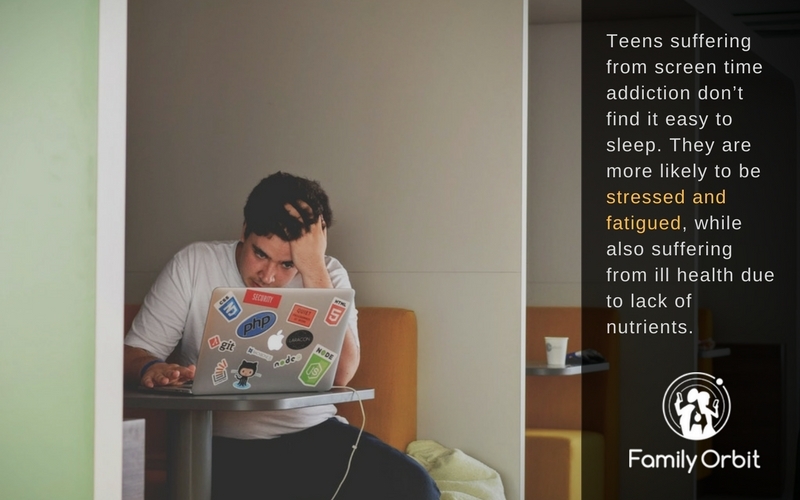 They are more likely to be stressed and fatigued, while also suffering from ill health due to lack of nutrients, especially vitamin D. Your teen will become irritable and moody, which is easily pushed off as normal teenage behavior at first but it grows to the point that it can become dangerous. Being tired can lead to mistakes elsewhere in life. If your teenager has access to the car, there’s a risk of using the phone while driving and that can cause an accident. The tiredness affects reaction times, leading to accidents and poor judgment. Screen time addition does hurt people if not treated early. There are many who believe that just having a screen will lead to addiction. The truth is the majority of people don’t need to be glued to their screens 24/7. They know when to put their phones down and when to stop playing the video consoles. Brains and bodies have enough and will tell you and most people will listen to that. Screen time isn’t the digital version of heroine. It’s not a case of one look and you’re addicted for life. This is just scare-mongering. We’re moving into a digital age. There is no way of getting away from devices and TV. You can’t just stop your child from interacting with their friends online. This is a lifeline for many at a time when they need peers to talk to. Computers are a necessary part of homework for the majority of students now. Rather than taking away all technology, it’s important to teach boundaries. Help to limit the amount of time on the screen, offering other ways to use up the time. Many parents grew up with books and magazines or listened to the radio while laying quietly on their beds or sitting on the couch. There wasn’t the need to listen and use the device at the same time. Encourage a few old-school techniques to use digital products moderately and make the most of life. While cyberbullying is certainly an issue, it’s not the only one. Nor is it really the biggest. There are so many dangers to using screens, whether your teens are only on social media to chat with friends, like to post their own YouTube videos, or are finding a way to connect to the Dark Web. Whatever they’re using a phone, tablet, or video games console for, there are dangers out there. Only focusing on cyberbullying will take away the focus on so many other issues, and it’s not only about screen time addition. You are more likely to miss online predators, the pressure to share passwords, and stalkers. There’s a chance your teen struggles to find a balance between using tech for school and for their own personal gain. By understanding this myth and knowing the truth, you can sit down with your teen and talk about all the issues faced with technology. This includes addiction and good practices. Make sure you know all about the myths and truths of screen time addiction. The more you know, the more you will be prepared to help your teen.